President Donald Trump's order for U.S. missile strikes on Syria has once again called attention to the presence of American troops who have operated inside Syria since early 2016. Last month, Trump signaled to military leaders that he'd like the U.S. to leave Syria "very soon" -- but Friday night's order for "precision strikes" on targets associated with Syria's chemical weapons capabilities, as well as small pockets of ISIS fighters still inside Syria, point to a longer-term American presence. 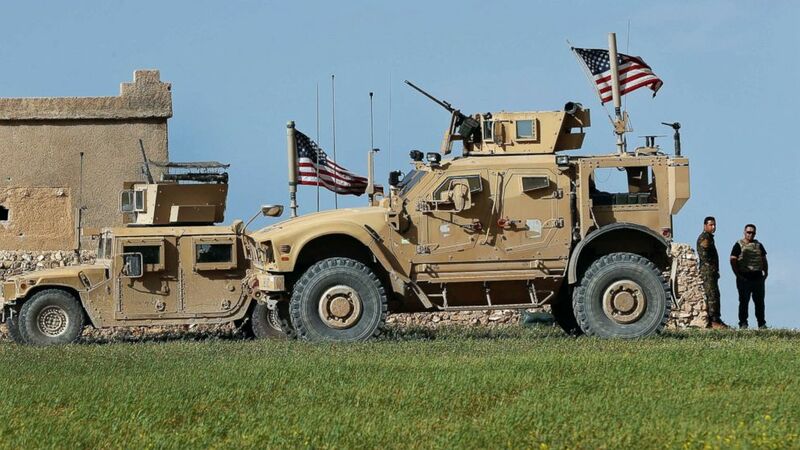 The U.S. has had a military presence in Syria since early 2016 to train and advise Kurdish and Arab rebel forces fighting ISIS in northern and eastern parts of the country. Those troops are backed up by forces from other countries like the United Kingdom and France that make up the anti-ISIS coalition. The size of the U.S. force in Syria has grown to roughly 2,000 troops -- up from 500 at the beginning of last year -- and the troops have aided their Kurdish and Arab partner forces, known as the Syrian Democratic Forces (SDF), in making massive strides in the fight against ISIS. In May, the more than 50,000 member-strong SDF, backed by the coalition, launched the long-awaited offensive to retake Raqqa from ISIS -- which had held the city since 2014. After a battle that left the city largely destroyed, the SDF declared victory on Oct. 20. Since then, a State Department official estimates about 100,000 former residents have returned. With the loss of their de-facto capital in Syria, ISIS fighters fled southeast towards the middle Euphrates River Valley close to the Iraq border. The most recent estimate from the Department of the Defense is that the coalition has retaken about 90 percent of the territory that once belonged to ISIS in Syria -- with remnants of the group still remaining. The military success hasn't come without cost to American lives. The U.S. has lost four service members since entering Syria in 2016 -- two in the last year. Master Sgt. Jonathan Dunbar, 36, of Austin, Texas was killed in Manbij several weeks ago after an improvised explosive device (IED) hit his patrol during a "kill or capture" mission against a known ISIS member. The U.S.-led fight against ISIS has continuously been distracted by Syrian-, Russian-, and Iranian-affiliated forces, operating in an ever-congested battlespace. At times, the U.S. has had military encounters with each of those forces. Over the summer, the U.S. conducted airstrikes against Iranian-backed militias and shot down pro-regime drones that encroached on American forces in a remote corner of southern Syria. Even more dramatically, the U.S. shot down a Syrian aircraft after it dropped a bomb near SDF fighters. It was the first time the U.S. had shot at a manned aircraft since 1999. In early February, a force that included Russian mercenaries opened fire on U.S. forces east of the Euphrates River, causing the Americans to kill at least "dozens" of Russians, according to the Russian Foreign Ministry. But the U.S. military says the goal continues to be the defeat of ISIS, even as the U.S. presence acts a deterrent from other regional powers gaining a foothold in other parts of Syria. "The hard part, I think, is in front of us," Gen. Joseph Votel, the U.S. Central Command chief, told an audience at the U.S. Institute of Peace earlier this month, "and that is stabilizing these areas, consolidating our gains, getting people back into their homes, addressing the long-term issues of reconstruction and other things that will have to be done." There are 11 USAID and State Department officials overseeing larger teams that work on de-mining, rubble removal, restoring services like water and electricity, and rebuilding schools and hospitals. The work will allow residents to return to their homes and stabilize the area from becoming a breeding ground for terrorist groups. The U.N. last estimated in December that about 715,000 people have been able to return to their homes -- in part due to these stabilization efforts. But the Trump administration continues to send what appear to be mixed signals about those efforts. Last month the Trump administration froze $200 million worth of aid to Syria. Trump has also publicly called for U.S. troops to withdraw from the country "very soon," surprising his national security team, as well as officials at the Pentagon and State Department. Last week, Joint Staff Director Lt. Gen. Kenneth McKenzie told reporters the president has "actually been very good in not giving us a specific timeline" for withdrawal. He added that there was always going to be an adjustment to the U.S. troop presence in Syria after ISIS's defeat. "So, in that sense, nothing actually has changed," McKenzie said of White House rhetoric. A State Department official agreed, telling ABC News last week "there's no specific timeline" for withdrawal. "We're where we were before," the official said. "The fight against ISIS is our priority in Syria, and we're committed to that fight until their enduring defeat." "Stick around to finish the job, and the president is on board with that," the official added. ABC News' Conor Finnegan and Luis Martinez contributed to this report.